Having been asked to join the Artists 303 group I am now exhibiting three of my packhorse paintings at ACEarts, Somerton. Route to the Sun – considering the east/west A303, is the theme for the exhibition. I chose to concentrate on packhorse bridges essential for journeys over many centuries before travel by car. Meet the artists on April 14th 2-4pm! 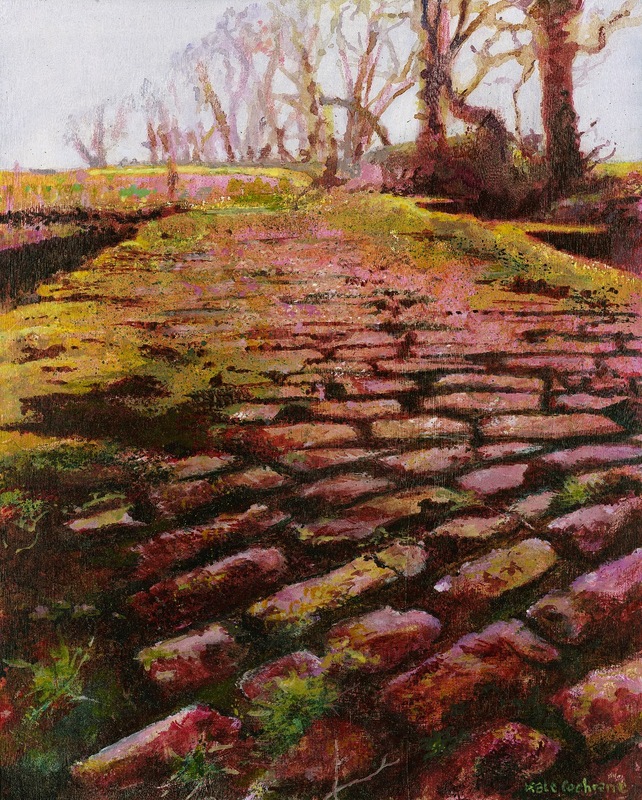 During May I will be exhibiting at East Lambrook Manor Gardens alongside Jason Nosworthy. The exhibition will include landscapes from my travels in Tasmania with the vibrant hues of coral fern bright from recent rain to the soft hues of spring blossoms. Themes include rocks and hidden water: a turquoise cove full of pink rocks, a glimpse of water trickling under ferns into Dove Lake or the spray from Nelson Falls. The textured rich landscapes mirror the carefree yet managed riot of colour and shapes found in Margery Fish’s surrounding cottage garden. Feedback from a friend is that she would absolutely love to be able to walk into my paintings – at least that is an advantage with the East Lambrook Manor cottage garden! Jason is a self-taught artist. He has a formal training in Landscape Design, dividing his time in the process of reproducing the landscape on canvas. Whether real or imagined, abstract or representational, his work is an innate response to his surroundings. In the broadest terms this can be seen as wilderness, or as a managed rural landscape setting, which is put through a filter and expressed in paint. Further to this, colour is used throughout in his work, heightening the senses and concluding in vibrant works of art. April brings much to do with preparing for the exhibition in May. I have been asked to run courses at Trowbridge Town Hall, do an Art Demo for Wareham as well as running a workshop for Warminster Art Society. This entry was posted in Exhibitions and tagged art, art gallery, Arts, cottage gardens, East Lambrook Manor Gardens, Exhibition, gallery, Margery Fish, NGS, painting, tasmania. Bookmark the permalink.